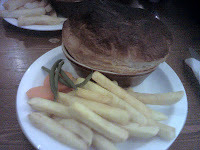 SJL found the urge for a British Pie Week pie overwhelming in the morning and went into a couple of establishments but sadly it is hard to get a hot pie before lunchtime. For some reason breakfast pies aren't as available as they should be. However, this was rectified at lunch by a trip to The Bree Louise pub in Euston, London. They have a great selection of pies and the pie of the day with chips and veg is only £6, which scores high on the cheapness, especially for London. SJL opted for the Chicken and Mushroom pie of the day. The chicken was great quality and the gravy was tasty despite not being very thick. However this was sadly just a top crust pie with a puff pastry lid. Therefore this pie, despite being nice, didn't really satisfy the pie urge and whether it is a proper pie is in question. SJL was unsure what the proper etiquette for eating these puff pastry top crust pies is. Do you take the lid off? Do you crumble it up and push it into the pie? We went for the later. The morning commute saw an opportunity for Pierateer RAS to notch up his first pie of British Pie Week with a cheeky Mr Kipling Apple Pie on the go (highlighting how convenient and portal pies really are!) Never had a commute to work tasted so good! Of course it is worth noting that Mr Kipling Apple Pies are the UK's favourite Apple Pie according to pie sales in 2012. Mr Ks were also given out to two colleagues at work to share the joy of British Pie Week at work! And after a day at work, what better plan than to chill out in a pub with a pie. And this was no ordinary pub - it was the Shakespeare (a Nicholson's Free House) in Birmingham City Centre. Before you ask, no, I wasn't bard! In fact the staff there were very accommodating and the Lamb Shank Pie I had was very nice, though rather expensive, for a top crust. A full review will follow later in the week! Pierateer TJP had prepared early and purchased an emergency 6 pack stash of Mr Kipling Bramley Apple & Custard pies just in case there wasn't an opportunity for pie during one of the days of British Pie Week. However, he didn't quite forsee himself having to crack open the pack on the first day - but a fairly hectic day meant he had to delve into his emergency supply early. TJPs pie count for the day is 2 Mr Kipling Bramley Apple & Custard pies.